The Florida Lighthouse Association was founded in 1996 for the purpose of creating awareness of Florida's 29 remaining historic lighthouses, the peril in which they exist and the heroic efforts of citizen activists in protecting, preserving and restoring these treasures. Each lighthouse is unique in history and architecture. The Florida Lighthouse Association is a consortium of the individual lighthouse organizations and interested individuals from across Florida and the nation. We meet three times annually, rotating the meetings among the various lighthouses. This gives us an opportunity to allow members to personally experience each lighthouse and encourage the membership to support the member lighthouses. 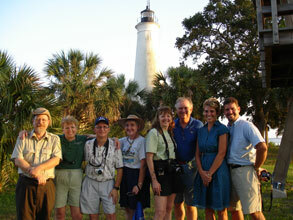 To establish a statewide association of lighthouse organizations, lessees, owners, and enthusiasts by which to showcase Florida's lighthouses and support the education of visitors and students from the nation and around the world concerning Florida's lighthouses, and to search for innovative ways to provide world class interpretation of these historic sites and structures. To engage in all lawful purposes that will benefit the preservation of Florida's lighthouses as permitted under the laws of the State of Florida for nonprofit organizations.